The Evil Genius Broderick Chavez is touring Australia! US sports performance expert Broderick Chavez, the Evil Genius himself, is in Australia for the first time in April 2018 for the Evil Genius Down Under seminar tour. Interviewed on stage by Aussie coaches Rawdon Dubois and Tommy Hewett from the Under The Bar Podcast and Dean McKillop from Flex Success, Broderick will detail his methods for athlete optimisation over an entertaining, no BS, expletive-filled day. 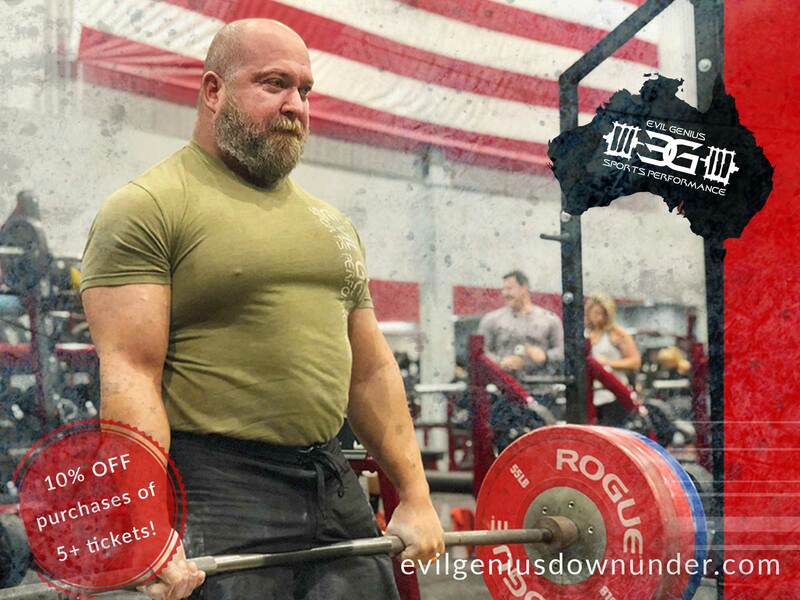 The content of the Evil Genius Down Under Seminar is suitable for bodybuilders, powerlifters, strongman competitors, strength athletes and coaches. The Evil Genius will breakdown diet strategies, training concepts including periodisation, and strategies for weight management in a contest prep. Check out the Evil Genius Down Under site for the schedule and to buy tickets! Use the code EVILUTB at checkout for $50 off each full price ticket!